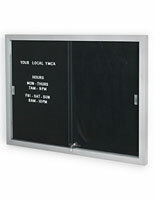 This Cork Board Is Framed in Aluminum Metal and Has an Acrylic Door! 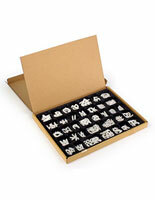 This Cork Board Is the Ideal Bulletin Board for Directories with a Letter Kit! This Cork Board is One of Thousands You Can Shop from at CorkBoards2Go.com! 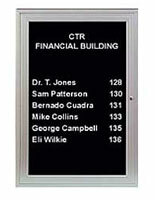 Satin silver aluminum frame for affordability and durability. Our cork board has hinged doors that come fitted with disc tumbler locks. Also, the cork board has acrylic shatter resistant panes. The cork board's interior case depth is 7/8", it's over all measurements are 30" x 36". 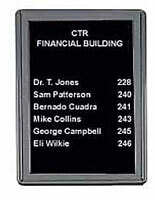 The cork board includes 327 0.75" letters, numbers, and characters. Four corner mounting holes are located on the rear of the display for the mounting hardware of these option (hardware not included). 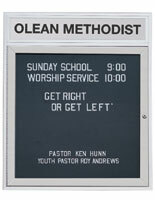 Cork board 's observable location is approximately 26"w X 32"h. This unit is designed for indoor use only. 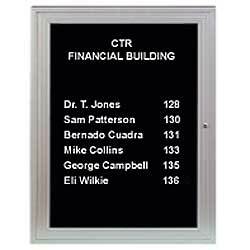 A cork board is perfect for offices or hotel lobbies, banks, or even churches. 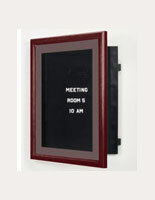 This cork board, bulletin board incorporates grooves so that its letters slide in with comfort. 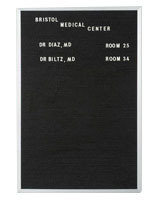 Whether exhibiting varying departments on hospital floors or merely welcoming new clients, this cork board is outstanding for whatever your needs are.